Well folks, the imminence of the holidays can no longer be denied. 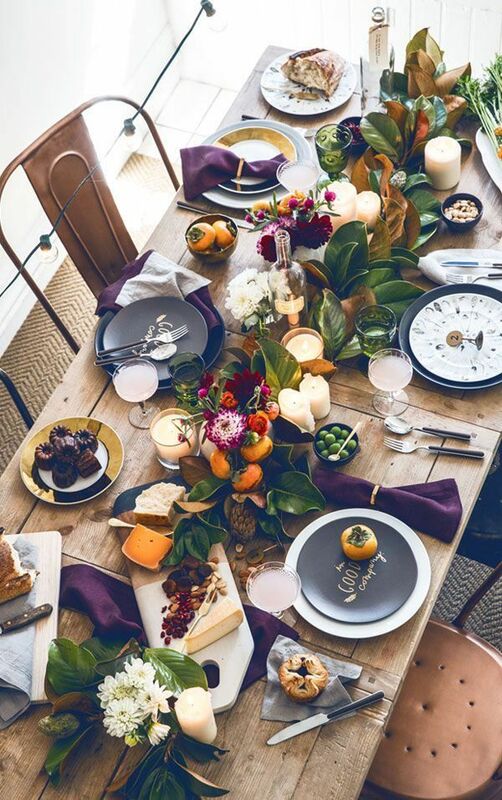 We’re both looking forward to festive dinners with friends and family in the coming weeks, and today we’ve rounded up our favorite holiday table settings from around the web. 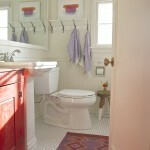 We’re both drawn to settings that are unfussy, a little quirky, and that have a bit of sparkle. 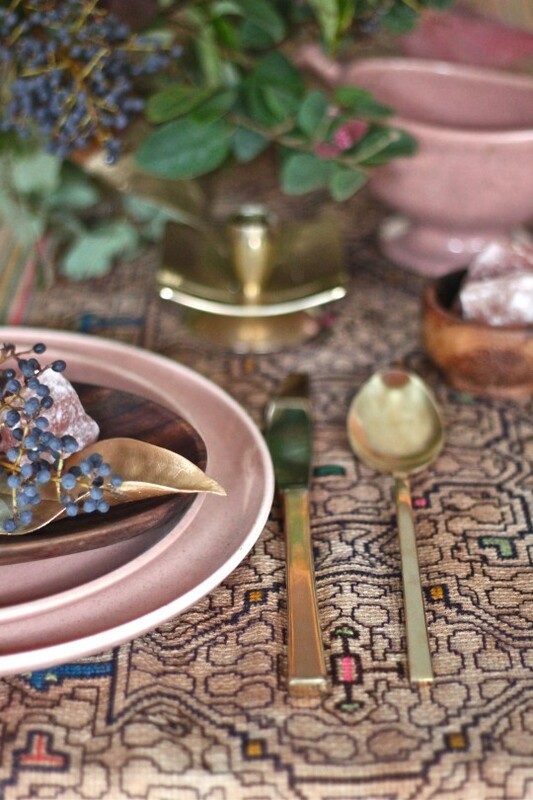 Debra Szidon’s mix of gilded leaves, pink dishes and gold flatware is pretty much perfection. 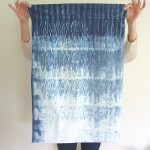 And that textile? YES PLEASE. This centerpiece of green leaves, persimmons, magenta flowers and white candles is simple and pretty. 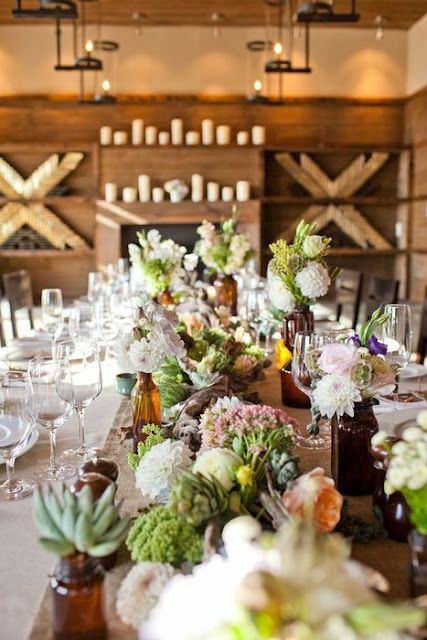 This one’s pretty fancy, but the addition of succulents, artichokes and brown glass bud vases adds nice texture and interest. 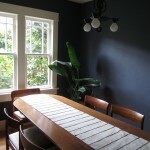 We love the eucalyptus leaves and be-pom pommed indigo runner! 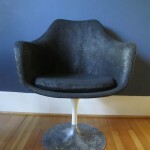 This is elegant, but perfectly unfussy. 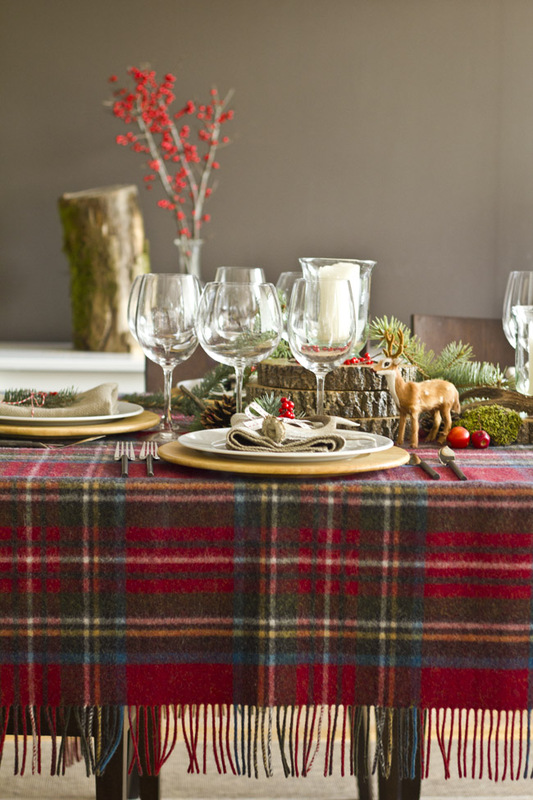 We also love the idea of using a plaid wool blanket as a table cloth. 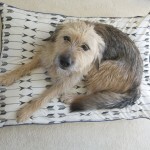 A striped Hudson Bay blanket would look great too! Justina Blakeney always gets it right, and the mixed patterns (made of scarves and wallpaper!) 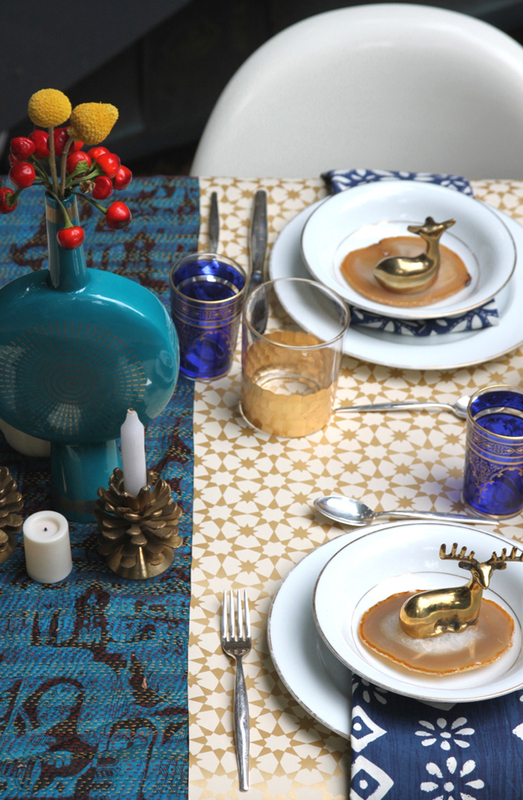 on her tables are the perfect backdrop for colored glassware, quirky vases and the little brass animals perched at each setting. Are any of you hosting Thanksgiving this year? 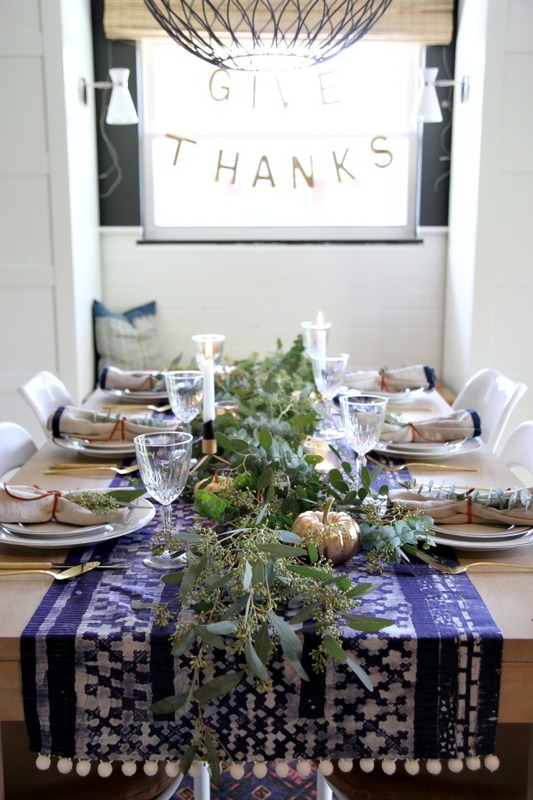 What are your favorite elements for a festive table? Have a wonderful weekend! 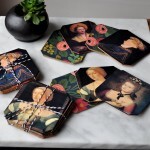 Oh these are such beautiful tabletops! 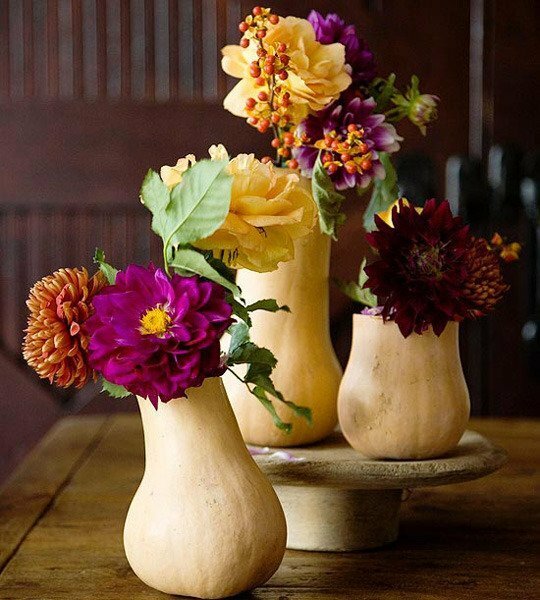 Gorgeous flowers and textiles – would be a pleasure to dine at any one of these tables! Inspiring to see as I begin to get out a more modest offering – lots and lots of candles in mismatched holders all down the center, salal and greens, Granny Trudy’s china, tablecloths and napkins with history – and best of all – place cards made by five-year old hands and updated each year. I do admit that the table is my favorite part of Thanksgiving – watching candlelight on faces of family and friends – thanks for this post! 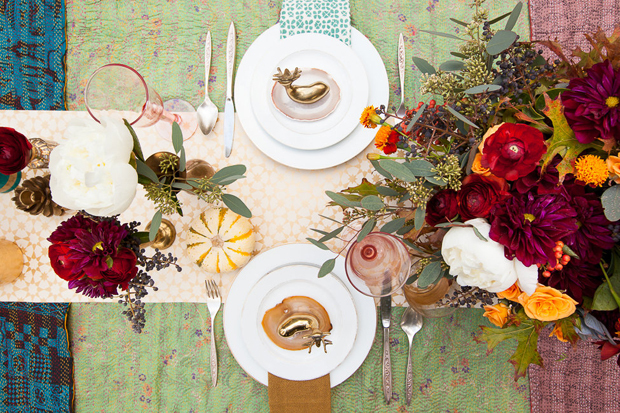 I love the colors and playful energy of the table settings. How many times as a little girl did I get out my Made in Occupied Japan china and set out to mimic the beauty and grace of my grandmother’s lovely and loving table – My mother was the artist with wild bits and pieces and she created the center while my grandmother set out china, glassware and sterling. She had mirrored place cards with a flower on each one. The names could be written and then wiped away. cooked. I don’t like tall, wide bouquets because they block our seeing each other across the table. I bought a tapestry piano cover years ago in an antique shop that reminds me of the colors in the first photo. I use it from Thanksgiving to New Year’s and put it away for another year. I love having pieces that come out for special rituals. 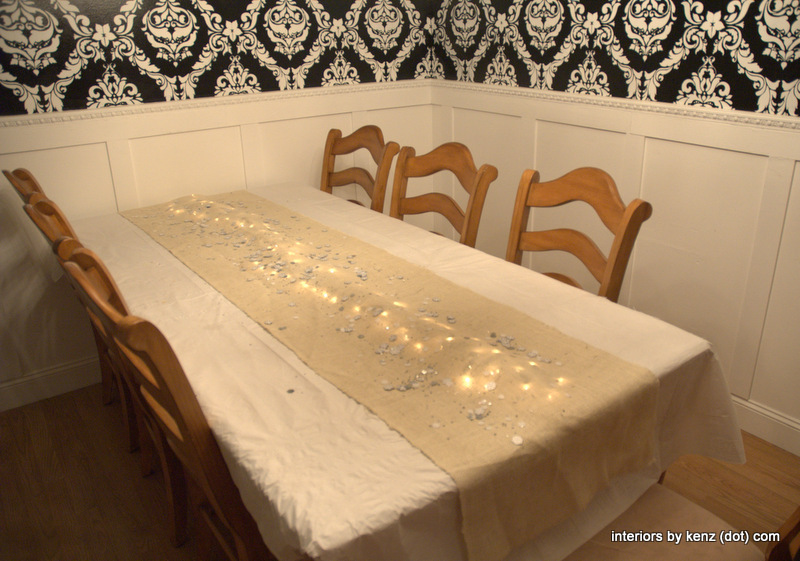 And, I love the way Mera and Katie your blog encourages me to go on recreating and reimagining those childhood tables! I loved looking at all these settings. So beautiful. When I was growing up the big Thanksgiving table on the farm always held two gigantic platters of fruit. On the table cloth around those platters were fall leaves and sometimes ferns. These decorations were colorful on the white tablecloth with white napkins and the only-used-on-Sunday-and-Thanksgiving china and heavy glass goblets.